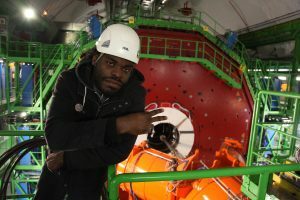 London-based rapper Consensus collaborated with Dr. Michael Hoch and Art@CMS at the CERN laboratory to create the nine track album, ConCERNed, that uses rap music to describe particle physics. Consensus has been featured on London Live Television, BBC Radio, Ethiopia’s EBC, The Voice Newspaper, at Cambridge and Oxford universities, CERN, and the Ontario Science Centre. Consensus will be at Fermilab’s Ramsey Auditorium on November 13 at 7 pm in a free public lecture/demonstration that will explore some of the process and details of recording ConCERNed, and how he arrived at the concept of exploring particle physics through music. Tickets are required, but are available at no charge – limit 4.